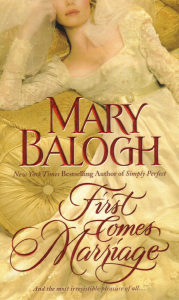 First Comes Marriage is Book I of a new quintet involving the Huxtable family-three sisters, a brother, and a male second cousin. At the start of this book Margaret and Katherine, the eldest and youngest sisters, are living with their young brother Stephen in a modest cottage in a small English country village. Their widowed sister, Vanessa Dew, lives with her in-laws at nearby Rundle Park. But life is about to change dramatically for all of them when Viscount Lyngate arrives unexpectedly on Valentine’s Day, bringing the startlingly unexpected news that Stephen has just inherited an earldom. All four siblings begin a new life at Warren Hall, Stephen’s principal seat. There they find a second cousin they have never met. Constantine Huxtable is the elder brother of the young earl who just died, but he could not inherit himself because he was born two days before his parents married and so was officially illegitimate. Con will weave his enigmatic way through the first four books before having his own story in the fifth. First Comes Marriage is Vanessa and Viscount Lyngate’s, story. Vanessa and Elliott dislike each other at first sight and nothing improves on second or third sight. But when it becomes clear that Elliott is about to propose marriage to Margaret simply because he needs a wife and she is a convenient candidate, Vanessa decides to take desperate measures and intervene. Her beloved sister has a strong sense of duty and might well accept the horrid Lord Lyngate for the sake of her family though she is deeply in love with a girlhood sweetheart who is off fighting in the Napoleonic Wars. Vanessa has already had her chance at love with Hedley Dew, to whom she was blissfully married for one year before his death. Now is the time to sacrifice herself for her sister, who has had no real chance at love and happiness at all. Vanessa Dew is attending an assembly at the village inn on Valentine’s Day, her first outing since her widowhood the year before. The rooms are abuzz with the startling news that a viscount and his secretary are staying at the inn and that they are going to attend the ball at the invitation of Sir Humphrey Dew, Vanessa’s father-in-law. Vanessa does not yet know that the viscount’s mysterious presence in their backwater of a village has something to do with her family. Like everyone else, including her friend Louisa, she is curious to know more about him. When he makes his appearance, however, she is far from impressed with what she sees. This is her first encounter with the man who is to be the hero of her story. Her father-in-law had entered the assembly rooms, looking important in his genial way, his chest thrust out with pride, his palms rubbing together, his complexion ruddy with pleasure. Behind him were two gentlemen, and there was no doubting who they were. There were very rarely any strangers in Throckbridge. Of the few there had been in living memory, none–not a single one–had ever attended a dance at the assembly rooms and precious few had ever been to the annual summer ball at Rundle Park. These two were strangers–and they were at the assembly. And one of them, of course, was a viscount. The one who stepped into the room first behind Sir Humphrey was of medium height and build, though there was perhaps a suggestion of portliness about his middle. He had brown hair that was short and neatly combed, and a face that was saved from ordinariness by the open, pleasing amiability with which he observed the scene about him. He looked as if he were genuinely glad to be here. 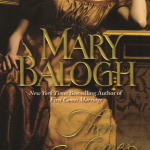 He was conservatively dressed in a dark blue coat with gray breeches and white linen. While probably past the age of twenty-five, he certainly still qualified for the epithet young. Louisa plied her fan and sighed audibly. So did a number of the other ladies present. But Vanessa’s eyes had moved to the other gentleman, and she knew immediately that it was he who had provoked the sigh. She did not participate in it. Her mouth had turned suddenly dry, and for a few timeless moments she lost all awareness of her surroundings. He was about the same age as the other gentleman, but there all similarities ended. He was tall and slim without being in any way thin. Indeed, his shoulders and chest were solidly built while his waist and hips were slender. His legs were long and muscled in all the right places. He had very dark hair, almost black, in fact, and it was thick and shining and cut expertly to look both tidy and disheveled at the same time. His face was bronzed and classically handsome with an aquiline nose, well-defined cheekbones, and the hint of a cleft in his chin. He had a firmly set mouth. He looked slightly foreign, as if perhaps he had some Italian or Spanish blood. She might have fallen headlong in love with him, along with at least half the other ladies present, if she had not noticed something else about him. Two things, in fact. His eyelids were half drooped over his eyes. He held a quizzing glass in his hand, though he did not raise it to his eye. He looked about the room as if he could not quite believe the shabbiness of his surroundings. There was not even the faintest suggestion of a smile on his lips. Instead, there was a hint of disdain as if he could not wait to get back downstairs to his room. Or, better yet, far away from Throckbridge. He looked as if this were the last place on earth he wanted to be. And so she did not fall in love with him, magnificent and godlike as he undoubtedly was to the eyes. He had stepped into her world, into the world of her family and friends, uninvited, and found it inferior and undesirable. How dared he! Instead of brightening her evening, as the presence of any stranger ought to have done–especially a handsome gentleman–he was actually threatening to spoil it. For everyone, of course, would fawn over him. No one would behave naturally. No one would relax and enjoy the dancing. And no one would talk of anyone else but him for days–or more likely weeks–to come. As if some god had favored them by dropping into their midst. And yet it seemed clear to her that he despised them all–or that at the very least he found them all a colossal bore. She wished he had come tomorrow–or not at all. He was dressed all in black and white, a fashion she had heard was all the crack in London. When she had heard it, she had thought how very dull, how very unattractive. She had been wrong, of course. He looked sleek, elegant, and perfect. He looked like every woman’s ideal of a romantic hero. Like that Adonis they all dreamed of, especially on St. Valentine’s Day, come to sweep them off their feet and onto his prancing white courser and away to a happily-forever-after in his castle in the clouds–white, fluffy ones, not damp, gray, English ones. But Vanessa deeply resented him. If he despised them and their offered entertainment so much, he could at least have had the decency to look like a gargoyle. She heard the echo of the sigh that had wafted about the assembly rooms like a breeze and fervently hoped she had not shared in it. “Which one do you suppose is Viscount Lyngate?” Louisa asked in a whisper–necessary in the hush that had fallen over the room–as she leaned closer to Vanessa’s right ear. No, he certainly did not. Or by anyone else’s from this humble, obscure corner of the world. His whole bearing suggested a man with an enormous sense of his own consequence. He was probably only ever bowled over by his own charms. What on earth was he doing in Throckbridge? Had he taken a wrong turn somewhere? The gentlemen did not remain long in the doorway. Sir Humphrey led them about, a broad smile of satisfaction on his face as if he were solely responsible for bringing them to the village on this of all days. He presented them to almost everyone present, beginning with Mrs. Hardy at the pianoforte, Jamie Latimer on the flute, and Mr. Rigg on the violin. Soon after, the gentlemen were bowing to Margaret and Katherine. And a few moments after that, they were nodding to Stephen and Melinda and Henrietta Dew, Vanessa’s sister-in-law, and the group of other very young people gathered with them. “I do think everyone ought to start talking again in more than whispers,” Vanessa whispered. The shorter gentleman exchanged a few words with everyone, she noticed. And he smiled and looked interested. The other gentleman–undoubtedly Viscount Lyngate–remained virtually silent and totally intimidated everyone. Vanessa suspected that it was quite deliberate. His eyebrows rose when he was introduced to Stephen, giving him a look of great aristocratic hauteur. And of course Melinda was giggling. Vanessa had, of course, been wondering the same thing ever since Katherine had brought word of his arrival this afternoon. How could she not? How could anyone not? Whatever business could anyone have in a sleepy backwater like Throckbridge, picturesque as it was, especially in the summer, and dear as it was to her? What business could a viscount have here? And what business did he have looking down upon them all as if they were mere worms beneath his expensive dancing shoes? She did not know the answers and perhaps never would. But there was no time for further speculation–not now anyway. Her father-in-law was bringing the two gentlemen their way. Vanessa wished he would not, but she realized that it was inevitable. Sir Humphrey smiled jovially from Vanessa to Louisa. Louisa hung her head in obvious mortification and curtsied low. Vanessa had made the right identification, then. But she had never doubted it. She curtsied. “Thank you,” she said while she was aware of Viscount Lyngate’s eyes fixed on her. She had worn her lavender gown after all as a slight salve to her conscience for deciding to come to enjoy herself–though she knew Hedley would have urged her to wear the green. It was not a vibrant lavender, and it had never fit quite right. She knew it was a dreary garment that did not become her at all. She hated herself at that moment for minding, for wishing she had chosen the green after all. She had grimaced inwardly at his opening words. She could have sunk through the floor at his last. She knew what he was going to say next. “Then I do not doubt one of these gentlemen would be delighted to lead you into the opening set,” he said, rubbing his hands together and beaming at her. There was a tiny silence while Vanessa fervently wished she could join poor Hedley in the grave. She was being asked to dance with a viscount. With this viscount, this most glorious of male creatures. This arrogant…popinjay. But sometimes her sense of the ridiculous came close to being her undoing. Whatever must the viscount be thinking? She almost laughed aloud and dared not glance Margaret’s way. But mortification quickly outpaced any amusement she was feeling. How absolutely awful that the assembly should begin this way. Was it her imagination that the whole room hung upon her response? Oh, goodness gracious. She really ought to have insisted upon remaining at home with a book and her memories. “Thank you.” She curtsied again and regarded the hand stretched out for hers with some fascination. It was as fine and as well manicured as any lady’s. And yet there was nothing remotely effeminate about it. Or about him, of course. Close up, he looked even taller and more solid and powerful than he had from across the room. She could smell a subtle masculine cologne. She could feel the heat of his aura. And there was one other thing about his face, she noticed as she set her hand on his and looked up at him. His eyes were not dark, as his hair and complexion had led her to expect, but were of the deepest, clearest blue. They looked back at her keenly from beneath those still-drooped lids. His hand was solid and warm. Well, she thought as he led her toward the lines that were forming and Mr. Rigg played a nervous little trill on his fiddle, this was an evening she was not going to forget in a hurry. She was to dance with a handsome, proud viscount–and the opening set, no less. She wished she could go home afterward and share the fun with Hedley. “Nessie?” Viscount Lyngate said as he settled her in the line of ladies and prepared to depart for the gentlemen’s line opposite. His eyebrows were raised again. He was not addressing her. He was asking a question. “Vanessa,” she explained and then wished she had not said it in such an apologetic way.